He then goes into the back room and returns with Jimmy Olsen. 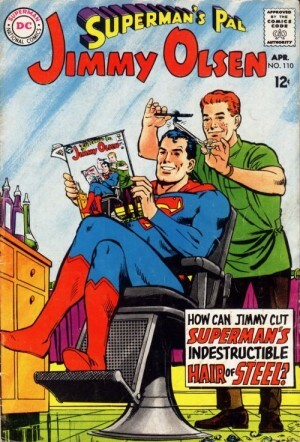 The owner takes Jimmy back into the back room, puts a Superman suit on him, combs his hair in the other direction and brings him back out front. It’s human nature for people to seek out the Superhero who will save the day. But in the real world, unlike comic books, Superheros only have so many hours in the week, and can only be in one place at a time. Equally important, not all problems require a Superhero, and can easily be handled by a Sidekick (sure, they work as a team, but sometimes Robin, the boy wonder, can match or out-perform his more famous mentor, Batman). In the world of professional services leadership, the “Superhero Syndrome” is a part of everyday business. Clients want the Superhero professional, while professional service providers face the task of balancing out what is really best for the client. If you are a sole practitioner, this may not be much of a problem – you are your firm and it becomes a matter of time allocation. But as you grow your business (and your partnerships), role players become an increasingly important part of your overall capabilities and offerings. Unfortunately, while you may be growing and expanding, your clients may still view you as the Superhero and pay little or no attention to the excellent staff, and their strengths in various roles, that you have built around you. As your firm grows, this problem can become a recurring event, as your employees begin to attain their own level of “Superhero” status in the eyes of your clients, many of whom will come to expect that they will always deal with their preferred member of your staff, and the reality that they can’t always have access to that individual can be a harsh pill to swallow. In some cases, the client may be willing to wait until that individual is available, but what if that individual isn’t (in your professional leadership opinion) the best role player to handle the job that the client needs for a particular task? This often occurs when a client’s needs change over time, yet they only feel comfortable dealing with the individual that they have worked with in the past. Are you marketing yourself or your firm? Do you promote a Collaborative Project environment? Are you unintentionally playing into a Bait and Switch game? These are merely starting points. Properly managing both staff development and client expectations & satisfaction is an ongoing, evolving task, that may differ given on the type of services being provided or the market that you are servicing. What are your thoughts? Have you encountered the “Superhero Syndrome” in your business? How have you dealt with it? What strategy worked for you? Add your thoughts below and share it with our community. NOTE: We’ll be discussing this topic in more detail on Thursday, March 3rd during the #ProfServ Twitter chat (10pmET). #Provserv is held on alternate Thursdays at 10pm ET. Hosts are Alan Berkson (@berkson0), Kelly Craft (@KRCraft) and Fred McClimans (@fredmcclimans). Previous PostInfluence and the Value of the IntroductionNext PostHas Knowledge become Commoditized? Aw Fred, my first thought was – of course you’re Superman – but as I read through – I think you are exactly right. So important to think about what you’re selling and what or who clients get. I can’t tell you how often I experience that “bait and switch” and it immediately has me lower my opinion of the “lead” that I was at first excited about. Just happened with my son’s orthodontist – of the 3 hours he’s spent there – 5 minutes have been with the orthodontist. You can’t have someone else step in if they really aren’t a “valid” replacement for you – have dealt with this first hand with consultants who work for me. Great points! Having spent many years in professional services orgs, your post really rings true with me. Many of the organizations I’ve worked in started out small, with one guy who knows everything about supporting the organizations systems. As the company grew, that guy simply didn’t have enough arms to continue to provide the same level of support so they hired a few more people, things got segmented and then the fun began. Nobody trusted the new guys, they were afraid that if they didn’t talk to superman, they would be wasting their time, or worse yet, things would get really squirrely and they would be doomed because they didn’t get the highest quality support. Meanwhile, superman is got more and more stressed out and the company was throwing good money after bad paying salaries for all this additional staff whom nobody trusted or used! I like your answer to this problem: it’s about being proactive. Many businesses give very little if any thought to the systems they use. They just assume that there will be phone service for example. It’s a given. While growth is still being discussed (before it ever happens), listen to the customer (in this case: the organization’s department heads and users of the systems) and ask the deep questions around what exactly they require, how important is it to the business and what level of risk are they willing to tolerate when it comes to their data, communications, whatever it is you provide. In other words, establish the value to them up front. Professional services leaders must make sure that professional services is thought of as a revenue generation component rather than just another liability. Once you have a seat at that table, it’s easier to have discussions about scale and relying on sidekicks because suddenly we’re talking about sustained profitability instead of panic and delusions. Unless you use the language of the business, this won’t happen. If organizations wait until something goes wrong to build solid professional services orgs, it’s going to cost a lot more than if they planned well for it before deployment and growth. Smart leaders are all about the “what if” and thinking like a chess player; 7 moves ahead.